With this Revel Class B diesel motorhome, your destinations are unlimited, and your world is open to endless possibilities. 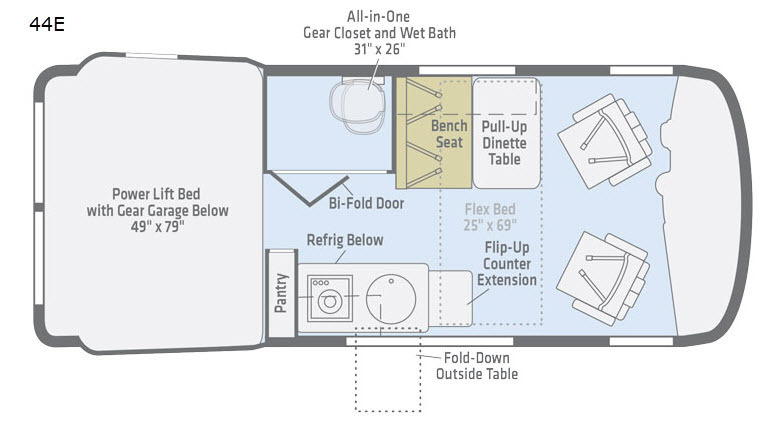 Because of the 4-wheel drive system that has been included in this unit, you can take your adventure off of the grid and still be completely stocked with the modern amenities you have grown to love. 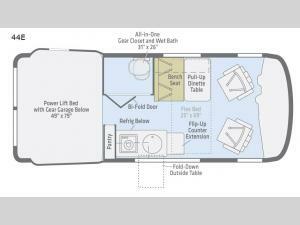 The 140 cubic foot garage space gives you the room you need to store all of your large outdoor gear, as well as sleep three people comfortably each night because of the power lift bed. 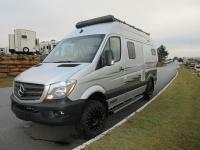 Winnebago has designed the Revel Class B diesel motorhome to be multi-functional and fully equipped. The solar power system provides the energy needed to run the single-burner induction range top and 2.5 cubic foot refrigerator, and the wet bath doubles as a storage closet when not in use. Built upon a 4x4 Mercedes-Benz Sprinter chassis, the Revel has proven to be the most off-road-capable RV ever constructed by Winnebago. Shower Size 26" x 31"